The 19-year-old has gone ahead and casually clipped the crossbar from 50-odd yards. Normal people settle an argument in normal ways, but professional footballers like Trent Alexander-Arnold just can’t do it in an old-fashioned manner. The England fullback, who plies his trade for Premier League giants Liverpool, had a dispute going with Manchester United winger Jesse Lingard, presumably after a training game, and went on to ping the crossbar from distance to settle the argument. That’s some hit, but it won’t come as a surprise for most Liverpool fans as the fullback is known for having a mean free-kick. The 19-year-old has made a fine start to the season, as have the rest of his club teammates, starting all four of Liverpool’s Premier League fixtures. Jurgen Klopp’s men have secured three points in all of their games so far to top the Premier League table on goal difference. And Gareth Southgate has a selection dilemma on his hands for fighting for the right-backs lot are Kyle Walker (Manchester City), Kieran Trippier (Tottenham Hotspur) and Alexander-Arnold. All of the aforementioned names are in fine fettle at the moment, but arguably it’s Walker who has the edge on his compatriots. And while Alexander-Arnold can play in central midfield as well, it’s unlikely that the Liverpool player will be asked to deputise there for the Three Lions. England take on Spain (September 8) and Switzerland (September 11) in the first international break of the season. 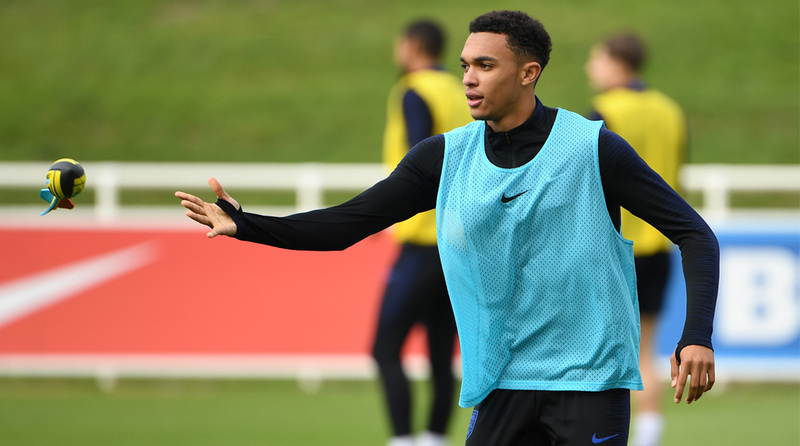 Southgate is expected to field different sides for the matches, which means playing time for both Trippier and Alexander-Arnold is almost certain.